This Black Sequin Short Dress with Open Back is a must have! This dress features pretty embroidered detailing, sequins throughout and mesh detail on back. 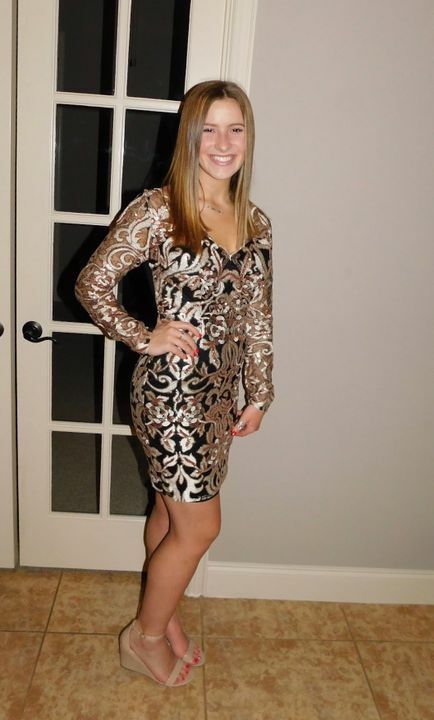 My daughter needed a dress for her school’s Winter formal. She couldn’t find anything she liked at the stores and then I discovered this website. We found this dress and it was perfect. I took her measurements based on the sizing guide and ordered a Medium. She was on the low end of the size medium chart so we probably could have done a small. It came quickly. Was really cutely packaged and the dress was exactly as seen in the picture. We will be shopping here for all of her dress needs now. Love the dress. Run's a little smaller than other dresses but still like it. Was perfectly sparkly for a nye wedding. Fit was spot-on. I would order true to size. Looks as it does in the picture which sometimes isn’t the case when online shopping I normally wear a medium but ordered a large in this dress and it fit perfect would highly recommend this site! Fits true to size. Beautiful online and even more stunning in person!